Pubs | veganopoulous.com <-- I've moved here! veganopoulous.com <– I've moved here! This was nice and spicy, with a smaller bowl of rice on the side. Now, as I’m watching my portion sizes this smaller bowl of rice was fine. But when I’m in my non-portion-size-watching mindset, I’d think more rice was needed. The National, or the ‘Nash’ as my dad would say– he used to work nearby and he and his colleagues would go to the Nash often. Dad even found rabbit poos in his salad, but that was twenty years ago– is quite spacious with tables set well apart. There’s an outdoor undercover area and the old school style toilet blocks are outside. Staff were friendly and I think everyone enjoyed their meals (vegetarian and omni). All in all, a good option for a nice Sunday lunch. The National Hotel is located at 344 Victoria Street, Richmond. We ordered our food at the bar and paid straight away. * Now for a note on the raw eating/how I felt side of things, as a follow on from previous posts. I was anticipating feeling quite heavy after having eaten mostly raw for the past five days. I felt okay, though I was pretty hungry when I ordered my meal. I had a healthy smoothie earlier in the day for breakfast and decided I’d have a green juice for dinner… until we had a last minute change of plans and I went out for dinner. That post will follow! 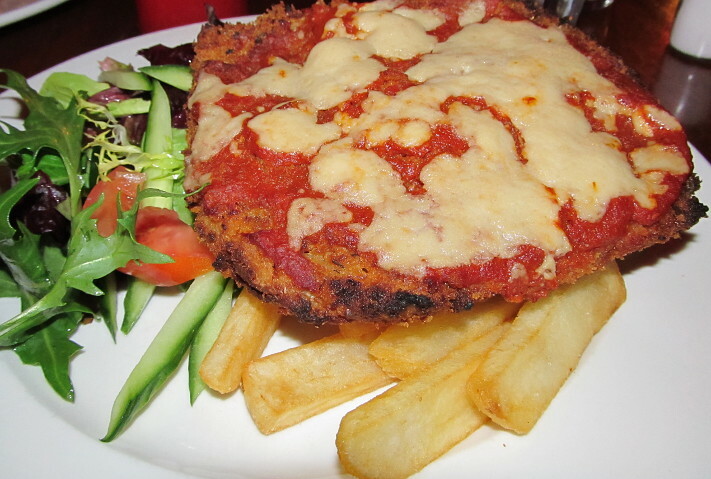 Before I was vegan, chicken parma (that’s short for parmigiana) was probably one of my favourite dishes to order in an eatery, though I’d often pick off the cheese because it was always big blobs of grease. Anyway, I’m a sucker for anything in a crumb coating so you can see why this was a fave. I did intend on making my own version at home with a Fry’s shnitzel but you know, mehhh. Husband and I had some us time. Which is the more-than-one-person version of ‘me time’. I suggested we go for dinner at The Cornish Arms as they have a great looking vegan menu as well as non-vegan options. Unfortunately I’ve had to give up my fantasy of Husband willingly eating at vegetarian/vegan establishments so when we go out to eat together, I look for places that cater fairly for us both. We got there at 7:00pm which was lucky for us because about half an hour later all tables were taken and newcomers had to wait. Our meals did take a while to come out (forty eight minutes to be exact) but I didn’t mind as I wasn’t ravenous. I also enjoyed hearing the staff taking orders to tables and noting just how many people ordered the vegan dishes. It was massive. I don’t know if you can tell just how big it is by looking at the photo but folks, this was MASSIVE. And thick!!! I knew there was no way I would finish it. I gave half the chips to Husband and I ate the salad but managed half the parma. 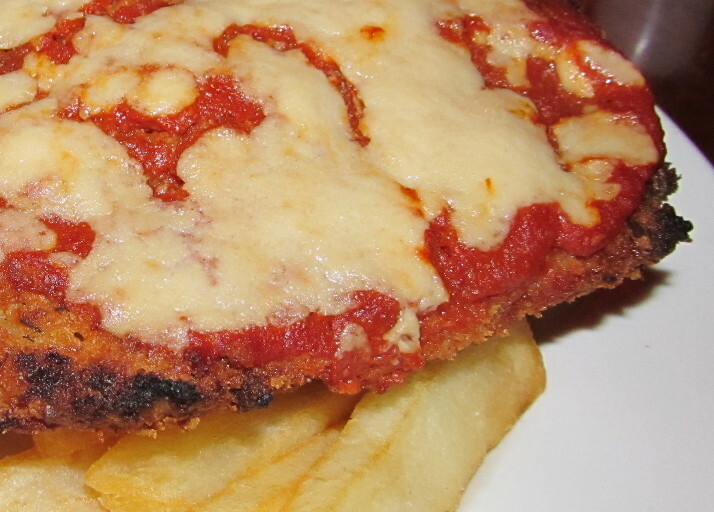 The parma itself was tasty and dare I say quite meat-like, though softer than what a chicken parma would be. But the crumb coating was great, the sauce was nice and the cheese was just the right amount for me. However there was a flavour of some kind of herb (or spice) in there that really got to me after a while and I had to put the fork down. I was stuffed full anyway so this wasn’t a big deal. I don’t know for sure what it was as there are a few things I don’t like that taste the same to me (but different to others. I have weird tastebuds). It tasted like allspice and I find even a teensy amount of allspice is too much for me. And even if this wasn’t allspice, it tasted allspicey. Here’s an extreme food closeup. Nom! The Cornish Arms is located at 163 Sydney Road in Brunswick. A New Home For Veganopoulous! And You're Invited!